On the sunniest days in Southern California, my mind takes me to the dark underbelly of Victorian England conjured up in one of the most chilling scenes in Dickens’ A Christmas Carol. 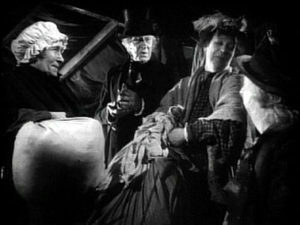 Scrooge sees a vision of the future in which, after his death, his charwoman, laundress, and an undertaker’s assistant visit a seedy haunt to sell his stuff. His charwoman’s haul even shocks the seedy buyer since she’s selling his bed curtains, “rings and all”, which she took down while Scrooge’s body was still in bed. What, you’re wondering, has this tale of a dead man’s belongings got to do with Southern California? 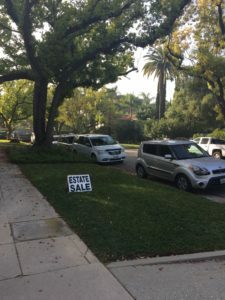 The answer is estate sales, so common here, where the belongings of a dead person, or a downsizer, are sold to the public – usually inside the person’s vacated home. Estate sales are often not as posh as they sound. Much of what’s on offer is like the stuff sold in car boot sales or yard sales here, in which people spread their unwanted items on their sun-soaked lawn or driveway. I love estate sales, yet I often feel I’m being intrusive. It’s not so bad, looking at second-hand stuff in antique stores and charity shops. But when you look at people’s belongings in the place where they were used and loved, it gets a bit personal. The guilt doesn’t kick in looking at furniture and rugs, but then I see tooth mugs and beloved Christmas decorations. Did the family smile every December when they put that angel on the tree? Did that musical box arouse sentimental feelings or was it an unwanted gift gathering dust? I imagine the lady of the house in her prime, putting on the dated evening dresses I see in wardrobes, then squirting perfume from the atomiser on the dresser. Is she dead now, or in an old person’s home? My friend Elaine sensibly makes me feel better about it all. She counsels me to think of the buyers as rescuing something that would “otherwise be headed for the dumpster”. My rescued two rugs and three vintage biscuit tins have pride of place in my home. I guess that one reason professional operators are usually hired to put on estate sales is that it can be hard for family members to watch complete strangers going through their relatives’ cupboards and drawers. Pros are not hurt by overheard comments on your late parent’s décor. Pros won’t accidentally sell stuff cheap, and they know that just because your mum cherished those wines glasses doesn’t mean they’re valuable. They’ll even sell what you’d most likely chuck. I’ve seen everything at these sales – including worn slippers, old bars of soap, and underwear. People buy anything. While I can understand a collector of old glass bottles seizing an empty bottle of Guerlain’s Mitsouko from years ago, I don’t get why anyone, except perhaps a movie prop buyer, would want a half-empty plastic container of Head & Shoulders shampoo. Going into some homes is like travelling into the past. One house made me feel like I was on the set of Mad Men. And the shag lavatory seat covers and doll which once hid the spare toilet roll under her voluminous skirts in another home, made me think of my childhood in Leeds. I enjoy guessing what the life of the owner was like by looking at their bookshelves and ornaments. Was the person with the huge collection of kitchenware a good cook, or did they just have a “thing” about bowls, spatulas and tupperware? Was the person with paintings of Africa and the Far East a traveller, or just someone who longed to visit faraway places? And what about the possessions not on sale? What was it about them that made the deceased’s family keep them, saved from the ignominy of public scrutiny? One estate sale with a collection of presumably once much-loved cuddly toys made me sad. I imagined their owner could place no price on the toys, but here they were with degrading price tags. Worse, two elephants which had probably been side by side for decades might be destined to be split up. Is this how some of my possessions will end up, catalogued and sold to anonymous people in a few hours? One friend intends burning many of her photographs because she knows her children won’t want snaps of her friends they never knew, and she dreads to think of them in a stranger’s hands. 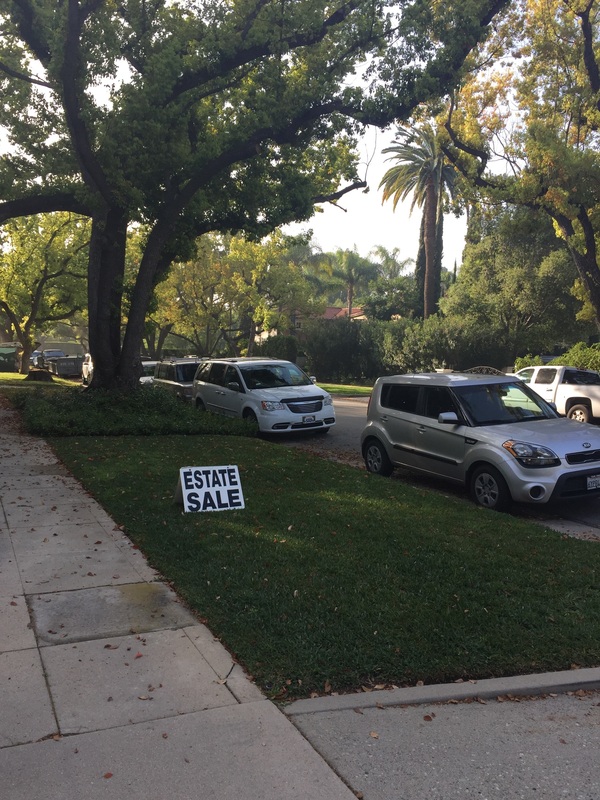 Estate sale operators tend to be pretty tough cookies. I guess they have to be when buyers swap ticket tags, secrete expensive items in the bottom of boxes of cheaper stuff, or hide items so they can come back when there’s a half-off sale. It’s not surprising they keep an eye on women with big handbags – just the right size for a bit of petty theft. 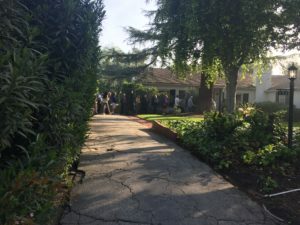 One estate sale maven in this area, the formidable Queen of Estate Sales Cynthia Abernethy, sends invites in which she includes a hall of shame, telling people terrible things buyers have done. Once someone returned to the house the night after the sale and stole the frog-shaped doorbell. She has been paid with counterfeit notes, and recently a woman accompanying a regular customer walked off pushing a full cart of stuff she hadn’t paid for. Cynthia is known for wearing a lapel pin bearing the word “No”, which she points to when people try to bargain her down. Estate sales, usually at weekends, bring out the predator in us. Queues outside pretty suburban homes frequently start hours before opening time. I’ve often arrived before 9am and had to fight my way past heavy-set guys, probably professional dealers, carrying their finds to trucks. Back home, I wonder what a person going through my home would think. And where will my trinkets end up when I die? Estate sales underline my determination not to collect stuff, and remind me that we don’t own possessions, we are merely their caretakers. One day my rescued rugs and tins will again be homeless. As a child growing up in a Yorkshire village, journalist Lynne Bateson rarely went to the city of Leeds just a few miles away, but she dreamed of living in the US. She made it. Here she recounts her adventures, taking a down-to-earth look at life Stateside.